Are you participating in Me Made May? In case you don't know what I'm talking about, it's a challenge dreamed up by Zoe - who teaches some of our workshops here at T&TB HQ (new dates up now if you wanna come!) - to wear your self-stitched clothes every day through the month of May. I've been playing along for five years now, and always find it a useful way of figuring out where the gaps are in my handmade wardrobe. I haven't been documenting my participation this year, mainly because I'm mostly wearing samples of patterns that we haven't released yet! 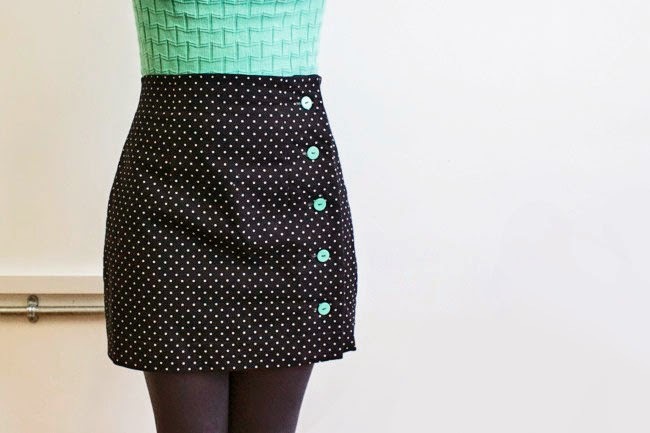 But here's one I can show you - a polka dot Arielle skirt, the mini version of the pattern. Yeah it's pretty chilly in London at the moment, hence the sweater and tights. I'm also wearing a vest, if you must know. I found the fabric in one of the shops on Goldhawk Road. I'm terrible at remembering the names of the individual shops, but it's the one towards the Japanese restaurant, you know, the one with all the fabric. Nope. It's gone. Anyway, it's a cotton canvas with a lovely texture to it. 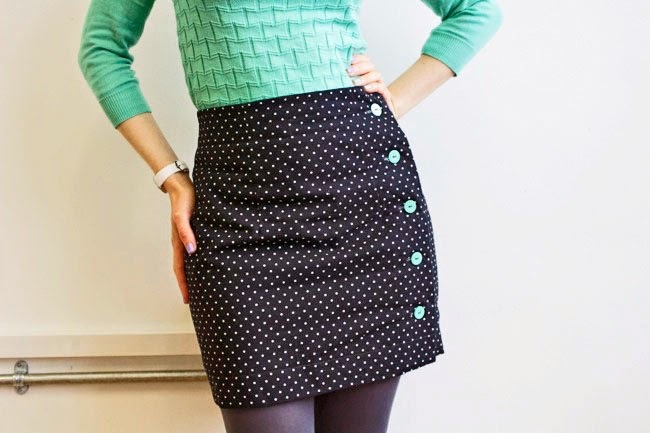 The turquoise buttons were sitting in my stash, just waiting for a button-showcasing project like this one. Ooh yes, and it's got a slightly mad lining! 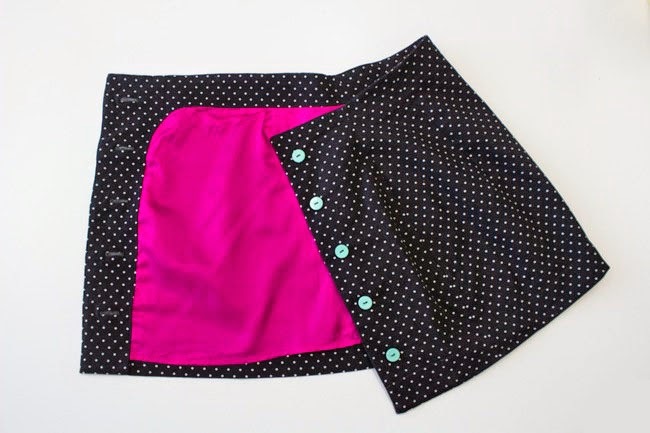 This hot pink lining fabric was also sitting in my stash. I love the way it looks against the more sober monochrome shell fabric. BTW I am LOVING seeing all the pics of people wearing the clothes they've made with T&TB patterns for Me Made May. So keep tagging me in on Instagram and Twitter - looking through them over breakfast is such an inspiring start to my day!